Sportradar, the global leader in analysing and leveraging the power of sports data, has announced a strategic partnership with the Canada Pension Plan Investment Board (CPPIB) and Silicon Valley-based growth equity firm TCV. GCA Altium acted as financial advisor to TCV. 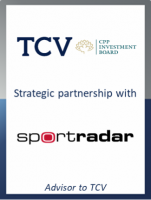 CPPIB, through its wholly owned subsidiary, CPP Investment Board Europe S.à r.l., and TCV will together acquire a stake in Sportradar at an enterprise value of EUR 2.1bn (~USD 2.4bn.) from private equity firm EQT and certain minority shareholders. Carsten Koerl, Founder and CEO, will retain his entire ownership position in Sportradar and will continue to drive its future development and growth. EQT will also reinvest a portion of its sale proceeds into Sportradar. Additional existing shareholders include Revolution Growth, Ted Leonsis, Michael Jordan, and Mark Cuban. Sportradar is the nexus between sports and entertainment, serving leagues, news media, consumer platforms and sports betting operators with deep insights and a suite of strategic solutions to help grow their businesses. Sportradar is the trusted partner of more than 1,000 companies in over 80 countries and serves as the official partner of the NBA, NFL, NHL and NASCAR, as well as FIFA and UEFA. It is also the only provider entrusted to work with the US sports leagues in an official capacity to distribute sports data (NBA and NHL) and AV content (MLB) around the world for betting purposes. With deep industry relationships, Sportradar is not just redefining the experience of being a sports fan; it also safeguards fairness in the sports themselves through its Integrity Services team. By monitoring abnormal betting patterns or social signals around matches, Sportradar’s Integrity Services division has escalated insights to authorities that have resulted in hundreds of sporting sanctions globally.